Most pickleball players have a stronger forehand than backhand. One of the nice things about pickleball is that its’ much easier to run around your backhand than it is in other rackets sports. Mainly because the court is so small and in just a step or two you are ripping a forehand and not too far out of position for the next shot. But sometimes, you really need to hit a backhand. You maybe be facing a server with very good accuracy and they are able to find your backhand like clockwork and/or if you run around to hit your forehand you will be very far out of position for the next shot. 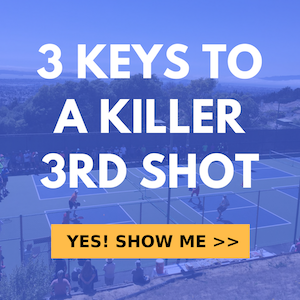 Just like with any shot in pickleball, as you move up the levels of competition, you will hit a level where your weakness can be easily exposed and that will certainly happen with your backhand if it’s weak. In this video we cover some of the key elements you must master in order to develop a strong and reliable backhand that can’t be easily picked on. Check it out.